This is a Sponsored post written by me on behalf of Sharpie®. All opinions are 100% mine. If there’s one thing I need to have in my kitchen drawer, it’s a Sharpie®. They’re one of those little items we probably often take for granted, but when we need it, we really do. There’s not many other markers that can take the place of a Sharpie. I’ve tried other permanent marker brands but they can’t compare to Sharpie. Whether it’s addressing a package, making a poster for homeschooling, or labeling a box in our attic, Sharpie is there with consistent clear results. I have some Sharpies in my drawer that I’ve had for years; they can really last a long time too. Now, Sharpie has even more to offer with some cool additions that are worth mentioning just in time for the holiday rush. 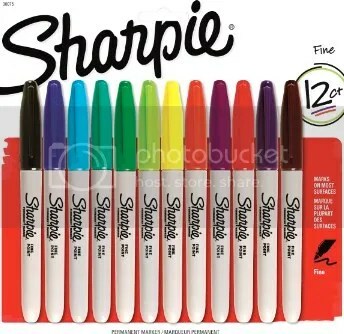 In addition to their usual fine-point markers, Sharpie now has a convenient 12 pack of colored fine-point markers – so you’ll have every color you need for the holidays. Think about all the ways we could take advantage of that! One of my favorite ways to use Sharpies around the holiday season is to label gift tags. Instead of using pens that don’t show up very well when you have excited children tossing presents around, when I use a Sharpie, it’s very obvious who the gift is for. And with the colored fine-point markers, it’s even more fun! There’s also new Metallic sharpie permanent markers. I already have some and they are so much fun to use! They add extra glam to whatever project I’m using them for. Now I readily admit that I’m not a very crafty person. But Sharpie makes it easy to turn something simple and mundane into something festive and fun. Whether I’m making a simple chore chart or doing a simple Christmas tree drawings with my children, using a Sharpie – especially one of the Metallic Sharpie permanent markers – can really add ‘zing’ to it! Even doing something as simple as addressing a holiday card can be jazzed up with a Sharpie! Make your Christmas card stand out this season with a bright color! Sharpie can even make a great stocking stuffer too. Whether it’s for a teacher in your life or for mom (I always appreciate new Sharpies) they can be a great practical and fun gift. 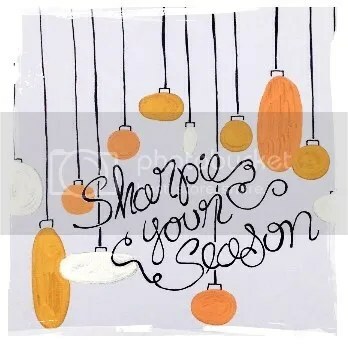 Check out Sharpie’s Holiday Happenings Pinterest board for more fun ways to use Sharpie this season. I love Sharpies! I really want to try those Metallic colors. I didn’t know Sharpie made metallics. Seriously it’s about time they came out with a huge colored pack like that!!! I’m tired of trying to gather up all the different colors. Lol. I love Sharpie! It is used a LOT in this house!! I have Sparpie pens in different colors, all over the house. Love them! Okay, I definitely love Sharpies. I have like 20 of them. They are perfect to write on our jewelry hang tags– which we use a ton of them! We’ve tried pens or other markers and they don’t look as nice. Sharpies are the best! These would be great all year round for all those projects the kids bring home. Are they new? i love sharpie markers! you’re right, they are great for crafts and other projects! i love using them for my scrapbooks. I don’t know of anyone, especially in the office who doesn’t love sharpies! They’re almost a necessity!! They are the best permanent marker out there and I love them!!! Great idea about using Sharpie’s for gift tag’s since pen’s really don’t work well for that. I’m going to do that this year! Love sharpie. Like the metallic colors. This would be a GREAT giveaway for me to win. Just in time for decorating and making signs for my 2 year old neice’s birthday party! I love my Sharpie’s so much , have for years they are the best around. I really like the new metallic one. They would be great for the holidays. I always have a big pack on multiple colors on hand for projects. i actually use them for so many other things too. Sharpies are a staple at our home! Love the new 3 metallic markers. I use the silver to mark black things. Makes it easy to see! I have got to get some of these my niece will love them! I am a twitter hoarder! For real, my desk overflows with sharpies. I have them in my purse, my laptop bag, by junk drawer! Sharpies are great! They are my go to marker for anything requiring a bit of color! I’m excited to learn about the metallic Sharpies! I have sharpies all over the house too. I have them in the kitchen so I can use them for marking my freezer foods with names and dates. We have them in both our desks and with our shipping supplies. Oh’ I can’t forget in my craftroom too. I had no idea they came in so many different colors now. I know that Justin Timberlake is a Sharpie fan!